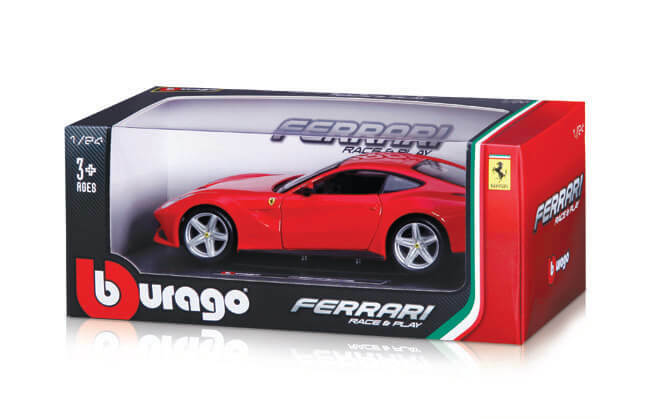 Quality, functionality and fascinating attention to detail, combined with plenty of emotion: Bburago, is one of the world’s leading manufacturers of model cars, raising the pulses of both young and old automobile enthusiasts, and discerning collectors with top quality, great functionality and fantastic attention to detail. Depending on the model and collection in question, for lovers of fast cars the roughly 90-page catalogue features all the automobile industry’s current top car brands, race cars, cult cars, street and retro classics, and motorcycles in the following scales: 1:64, 1:43, 1:32, 1:24 and 1:18. Cooperation with Ferrari forms the basis for a complete toys and games action series named ‘Ferrari Kids’ and ‘Ferrari Race & Play’.